We bought a new coffeemaker yesterday. It’s a purchase we have to make every year, regardless of how much we spent on the latest and greatest Bunn or Braun or Cuisinart or Melitta model the year before. Everything is made of plastic these days. Nothing is engineered to last. I did some online research and to my amazement, learned that Consumer Reports rates the lowly Mr. Coffee Model No. VMC-SJX33GT to be the best coffeemaker on the market, outperforming prestige brands that cost well north of $100. So I went to Target and bought one for $29.95. 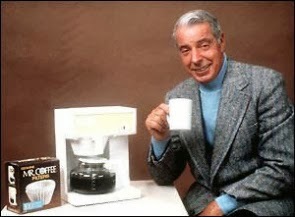 Those of you of a “certain age” will remember that the first spokesman for Mr. Coffee was baseball great Joe DiMaggio. Joe, who had been retired from the Yankees for more than 20 years when he signed on the dotted line with Mr. Coffee in 1973, appeared in commercials for the brand well into the 1990s. Funny thing is, Joe preferred instant coffee. How do I know this? Because, in 1979, at the same time he was working for Mr. Coffee, Joe was also spokesman for The Bowery Savings Bank in New York. The Yankee Clipper was the perfect celebrity to represent a financial institution that targeted working-class New Yorkers, many of whom who considered him a god. I was working for the ad agency that handled the account. In fact, The Bowery was my account – my responsibility – and my duties included keeping Joe happy when he came to town twice a year from his home in San Francisco to shoot commercials and pose for print ads and brochures. For the first photography session at which I was going to meet Joe, I made sure we had a Mr. Coffee machine in the studio along with a can (coffee came in cans back then – ask your parents) of every brand of coffee Gristedes supermarket sold. “I want a cup of Taster’s Choice freeze-dried instant,” he announced. The photographer instructed his assistant to run to the nearest grocery store to buy a jar. She was gone for what seemed like an eternity. After thirty minutes or so she returned, said she had been to half a dozen stores and none carried the freeze-dried version, but that she had bought a jar of regular Taster’s Choice Coffee. “I want freeze-dried,” Joe said, as if she had suggested he drink coffee made from ground rat turds. An hour and several dozen desperate calls later, a jar of Taster’s Choice Freeze-Dried was located at a supermarket several miles uptown from the Chelsea studio in which we were shooting. When the guy who answered the phone was told it was for Joe DiMaggio, he offered to hop in a cab and bring it himself if he could meet him and get an autograph. When he arrived, Joe refused to give him one. Joe’s cuppa joe was made and served to him in a china cup with saucer. After precisely one sip, he set it aside and announced he was ready for the photographer. Back to our new Mr. Coffee machine. Problem: The “Brew Now/On” light does not light up. Possible Cause: The appliance is unplugged. Problem: The coffeemaker only brews water. Possible Cause: There are no coffee grounds in the filter basket. Solution: Add the desired amount of coffee to the filter. Problem: The coffee is not hot. Possible Cause: There is a power outage. Solution: Wait for power to be restored. Having brewed my first pot in our new Mr. Coffee machine this morning, here’s one I’d like to suggest be added to future editions. Problem: Coffee has a distinct plastic aftertaste. Solution: Make yourself a cup of Taster’s Choice Instant Coffee in the microwave. Need a vacation? This one's for you. I have been collecting vintage posters for 30 years. I always rationalized the money I spent as an investment and promised myself that, in my dotage, I’d sell them off to generate income but the fact of the matter is, for every one I sell, I seem to buy two more. I can't help myself. I'm particularly keen on posters printed during WWI and WWII urging citizens to enlist, conserve resources, buy bonds, and work hard to support the war effort. My most recent acquisition is the poster shown above. It was issued in 1943 -- during the middle of WWII for my historically-challenged readers – by the Industrial Incentive Division of the US Navy and distributed to companies building ships. Companies were instructed to display it to discourage workers from asking for time off. The poster features two sailors and a Marine who -- well, you can read about them yourself, starting with the story of Chief Gunner’s Mate Albert Noland. Though most WWII posters were produced by the thousands or even hundreds of thousands, only a handful of these were printed – there simply weren’t that many companies producing warships. If you would like to purchase this piece, I’ll be happy to sell it to you. I’ve spent most of this week cataloguing my collection of nearly 250 posters. Some are worth a lot. Some aren’t – I bought them just because I liked them. Pictured above is one of the latter that I had forgotten about, a poster showing an illustration of the Washington Monument that was issued by the National Association of Manufacturers. Though I can’t say for sure when it was printed, the copy in the small box to the left of the main copy refers to “World War I” which, until WWII, wasn’t referred to as World War I; it was called the “Great War.” I’d have to guess it’s from the forties, perhaps the early fifties. Can you imagine a kid today, given the same assignment, being able to write one-tenth as eloquently as Master Meloney?